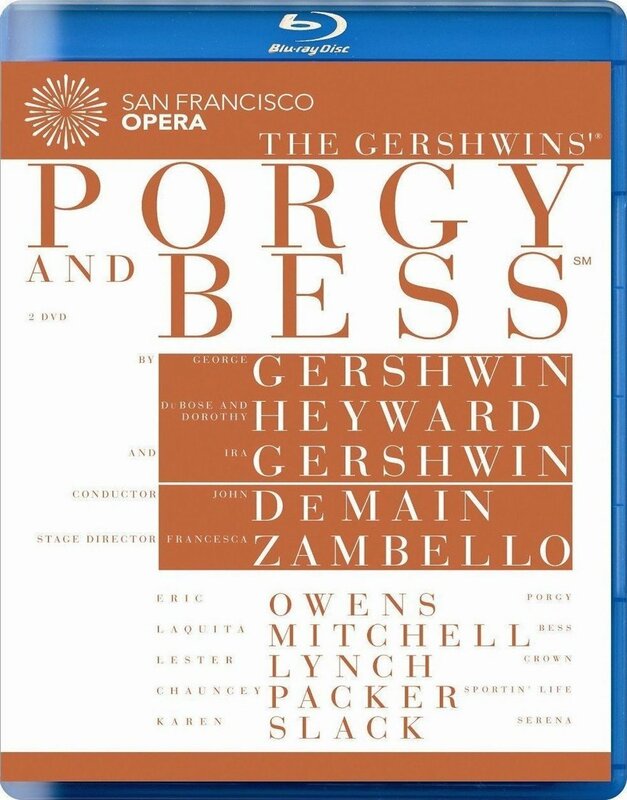 "The Gershwins' Porgy and Bess" (2009, San Francisco Opera, live performance recording; 2013 limited theatrical release; 2014 disc release), Blu-ray. A EuroArts release. HD Extras include an 11 minute interview with San Francisco Opera General Director David Gockley, who is also responsible for the iconic, 1976, Houston Grand Opera production -- the first production ever to treat this work as Grand Opera; including restoration of the original scope of the Gershwin score. Also a 6 minute interview with Conductor John DeMain. Also a 4 minute interview with Director Francesca Zambello. And 8 minutes of interviews with the principal artists. Set in Charleston, South Carolina, the piece would be steeped in the the language, rhythms and culture of the impoverished black community there -- with George Gershwin even moving there from New York to get a better feel for the locale and its music. Though the story is a folk tale, the Gershwins were determined to create it in the operatic form. And so, to insure the entire sweep of the music would present as one piece, they avoided incorporating existing, traditional folk music. Instead, George Gershwin composed original spirituals and songs in the folk music style, but incorporating the motifs of their opera. The Gershwins were also convinced only black artists could present Porgy convincingly. And since opera companies in New York in the 30s were pretty much all white, they ended up reverting to a format they knew to be more flexible: The Broadway musical. After the necessary revisions, "Porgy and Bess" opened on Broadway in 1935, and then toured in major cities. From the start it was controversial, and pretty much a box office flop. This was NOT the music or type of story fans of the Gershwins had come to expect. And the racial aspects brought condemnations from BOTH black and white commentators, and celebrities. Never the less, the Gershwins pressed on. HISTORICAL NOTE: In Washington, D.C., the touring cast successfully protested racial segregation of the audiences, and for the first time ever, the National Theater, in the nation's Capitol, was convinced to allow an integrated audience. The piece languished from the 40s through the 60s, with occasional, Broadway-style revivals, and film adaptations, which never made all that much of an impact, as good as some of them were. It was, after all, still "just" a Broadway musical. Then, in 1976, all that changed! The Houston Grand Opera revisited the ORIGINAL Gershwin score -- rediscovering the cuts which had been made for staging the Broadway version -- and determined FOR THE FIRST TIME EVER to present "Porgy and Bess" as the Grand Opera the Gershwins had always, really intended. In addition to restoring the sweep of the music, this also meant a large-scale production: With a full operatic orchestra, and not only classically trained principal singers but an operatic quality chorus! That last makes a MAJOR difference, as a substantial part of Porgy resides in the singing of the chorus. It was, quite simply, a revelation! And the opera world took note. Nine years later -- 50 years after its creation -- "Porgy and Bess" finally had its premiere performance at the Metropolitan Opera in New York. It is now considered a major, repertory work, performed regularly, around the world. This Blu-ray captures a live performance, from June, 2009, at the San Francisco Opera, under the General Direction of David Gockley, who was ALSO the person responsible for that 1976, Houston Grand Opera revival. Francesca Zambello, who Directed the operatic production, also Directed this video recording. The result is one of the best opera videos I've seen to date. In particular the choice of camera angles and zoom is well chosen to allow the full scale of the staging to show through, while also indulging in closer shots for solos and duets. This is a particular bugaboo of mine, as opera on film and video is often shot like some sort of TV show -- with tons of cuts and egregious close ups at inappropriate times. PQ is exceptional -- with absolutely no signs of video noise in low-light sections, and fine detail throughout. The color scheme of this production tends towards rust browns, so don't expect a wide gamut of saturated colors. But what's on the stage is precisely captured. AQ is also way above other opera Blu-rays I've heard recently. This is a high bit-rate, 96KHz track, and the San Francisco Opera people have found the trick of mic'ing a live performance for proper fidelity. Listen for example to the chorus praying as the hurricane approaches in ACT II. The staging calls for individual chorus members to clap spontaneously as they pray. Those claps sound absolutely authentic and nicely placed in the sound field. Dynamic range is also excellent. Since this is a LIVE production, there are a few gotchas -- audience noises and variations in volume as non-principal singers move away from the mics. But the rest, including things like occasional imbalance between the orchestra and the singers, is correctly captured. I.e., this is the sort of stuff that HAPPENS in a live performance. The cast and conducting are fully up to the standards of this opera company. (The performances were sold out, and widely acclaimed.) I've not had a chance to hear this opera live, and so don't really have a proper point of comparison. But in my opinion, the only weak performance in this one was from Chauncey Packer, portraying Sportin' Life, the dope peddler. Eric Owens takes the lead as Porgy, the crippled beggar, with Laquita Mitchell as Bess. John DeMain conducts. If you know of "Porgy and Bess" only from the song, "Summer Time", you've got a surprise coming! This is a serious work with serious themes, and an ambiguously uplifting ending. Like many Grand Operas, many people die. But the music is complex, and gorgeous. And when presented full scale, as here, this truly is Grand Opera.